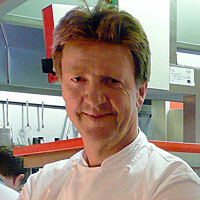 Chris Chown is Chef / Proprietor at Plas Bodegroes, Pwllheli. Biggest influence : My mother. Favourite local produce : Hand-dived Cardigan Bay scallops. Favourite dish : Tom yam. Gordon Ramsey or Jamie Oliver? Neither. AA Gill. He needs educating. Classical music, rugby and modern Welsh art.